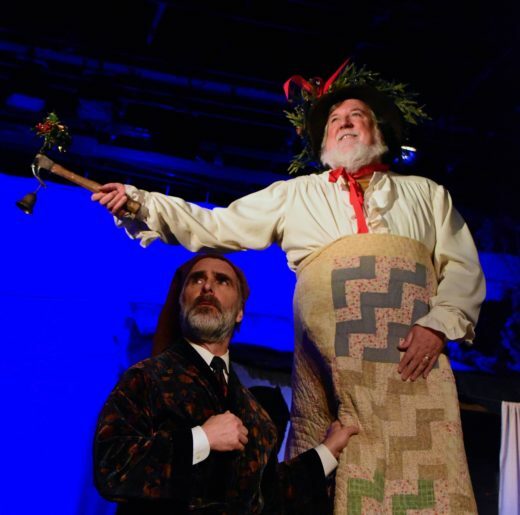 (Left) David Whitehead as Ebenezer Scrooge and Ward Kay as Ghost of Christmas Present. Photo by Chip Gertzog. “As the tale of hope and redemption unfolds ‘onstage,’ the spirit of Christmas spreads throughout the townspeople, and by extension, the audience.” “Midwestern bluegrass adds both depth and mirth to the show without overwhelming the story or performances. I also loved how creative the story was – they could only use what little they had, and suddenly, rubber tires and sheets hanging on a clothesline (among other things) became several imaginative props.” “Providence Players’ A Christmas Carol delivers a new take on an old favorite…This is a show that is worthy of your time and ticket!” Read the entire DCMTA review here. Audience members raved about the production. “I was so moved,” one patron shared. 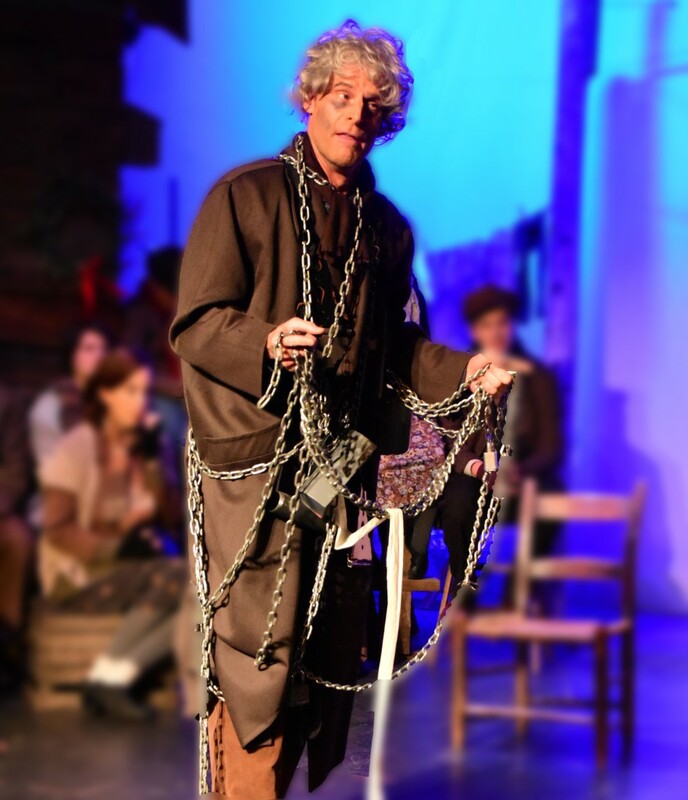 “Watching Ebenezer’s redemption just brought tears to my eyes.” Julia Exline shared about the cast, “The large cast displayed a lot of talent… David Whitehead is fantastic as both John Charles and Ebenezer Scrooge, two similar personalities who experience the same awakening. Ward Kay gets a lot of well-deserved laughs as both Mr. Fezziwig and the towering Ghost of Christmas Present, and Daniel Lavanga gives a solid performance as Bob Cratchit. 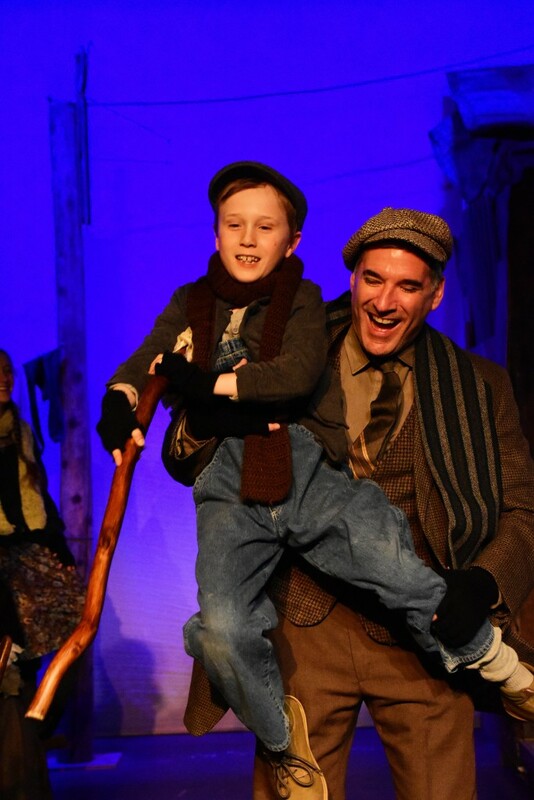 Young actors take the stage as well, with particular standout performances by Talia Cutler and Caden Mitchell, who show a great deal of potential as Ghost of Christmas Past and Tiny Tim.” This is a must-see Providence Players production. 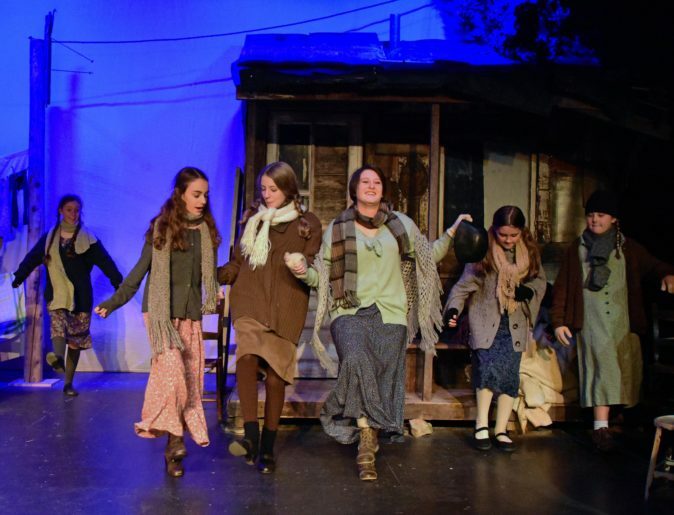 (L-R) Talia Cutler as Emma, Chloe Sinder as Lily and Sarah Lemon as Jen, dance to stay warm as others look on. Photo by Chip Gertzog. Steven Palkovitz as the Ghost of Jacob Marley, tormented. Photo by Chip Gertzog. Caden Mitchell as Tiny Tim and Daniel Lavanga as Bob Cratchit. Photo by Chip Gertzog.